Royal Magician. Skilled in magic, but can be short-tempered and stubborn. He set out in the gummi ship with Goofy to find the king. Donald has joined forces with Sora, the key bearer alluded to in the king's letter. Royal magician. Skilled in magic, but short-tempered and stubborn. Because Mickey said to follow the key bearer, he once left Sora to follow Riku. But friendship soon led him back to Sora. Court Wizard at Disney Castle who set out with Goofy after the king's disappearance with orders to find the Keyblade Master. His short temper sometimes gets him into trouble, but he is very brave and caring of his loved ones. He would put his life on the line if it meant helping a friend. Not long ago, Donald left Disney Castle with Goofy to search for King Mickey. During that quest, they met Sora and became fast friends. After they helped Sora save the worlds from darkness, Donald and Goofy continued their search for King Mickey, who had decided to stay behind in the realm of darkness. But before they could find the King, the three friends were plunged into a deep sleep. A magician in the service of King Mickey. He and Goofy rushed to Yen Sid's tower when they heard their king had gone missing in the middle of his training. A magician in the service of King Mickey. While full of vim and vigor, his short temper sometimes gets him into hot water. Donald met the real Sora while on a journey to find Mickey; during the course of their travels they became fast friends. After reuniting with Mickey and fighting off the hordes of darkness, Donald returned to Disney Castle to enjoy a bit of peace. King Mickey's court magician and a loyal friend. Donald has journeyed with Sora many times to save the worlds. He is with the king and Goofy, keeping an eye on Sora and Riku as they take the Mark of Mastery exam. An overnight Musketeer and good friends with Mickey and Goofy. Donald was a chicken, but his adventures with Mickey and the others gave him the courage to become a Musketeer in heart and in name. The Royal Court Magician. Skilled in magic, but short-fused and stubborn. A magician in the service of King Mickey. He has a short temper. The Royal Court Magician and good friend of King Mickey. The Royal Court Magician in a Halloween getup. A musketeer in training along with his friends Mickey and Goofy. The Royal Court Magician in his Timeless River form. King Mickey's court magician and a loyal friend. Donald has journeyed with Sora many times to keep the worlds safe. He has pledged to help Sora through the trials ahead. "But you can't come along looking like that. Understand? No frowning. No sad face. Okay?" Donald Duck is a major supporting protagonist from the Kingdom Hearts series. Donald is the Royal Magician of Disney Castle and the royal assistant for King Mickey. As such, his weapon of choice is a Staff. He is a major source of comic relief in the series, thanks to his rash, aggressive, and sometimes selfish tendencies, as well as his dangerously short temper, but he nonetheless remains loyal to his friends. Though he initially only cares about Sora as a means to track down King Mickey with Goofy, Donald soon grows to deeply care for him as a friend. During development over the main character, Disney had initially chosen Donald Duck as the protagonist, while Square Enix wanted Mickey as the protagonist; however, this was scrapped as Tetsuya Nomura did not like either ideas and wanted a human character, and thus Sora was created. Donald is a resident of Disney Castle, where he lives with his friends King Mickey Mouse, Queen Minnie, his girlfriend Duchess Daisy Duck, and Goofy, the captain of the Royal Knights. He himself holds a respectable position as the Royal Magician for the King, and has been trained under Merlin to harness his magic. He's been living here long before the castle was built — back when the world was called Timeless River. He also has several relatives that live in the nearby Disney Town: his nephews Huey, Dewey, and Louie, as well as his rich uncle Scrooge McDuck. When King Mickey decides to have Master Yen Sid test him for the Mark of Mastery, Donald accompanies him to the Mysterious Tower along with Goofy. After the King steals a Star Shard to help the other worlds plagued by the Unversed, Donald and Goofy are left moping around and waiting for his safe return. Ventus later arrives via the Star Shard, which he found in Neverland. Yen Sid reveals that the constant unstable transportation of the Star Shard kept him from finding Mickey, to which Donald is relieved as it means he can now be found. Through a magical mist Yen Sid conjures, it reveals Mickey lies badly injured at the Badlands. Ventus goes to rescue Mickey, not wishing to put Donald and Goofy in danger. Aqua later returns with Mickey, who remains unconscious from the beating Vanitas gave him. Donald and Goofy tend to the King, until he recovers and heads to the Keyblade Graveyard himself. After Aqua takes Ventus to be hidden in Castle Oblivion, Donald and Goofy watch as Mickey hands over his Keyblade and Star Shard to Yen Sid, believing himself unworthy. However, Donald becomes elated when Yen Sid returns the Keyblade, a sign that the King has been named a Keyblade Master. Donald strikes Goofy to get his attention. One day, Donald goes to see the King in the morning, but is shocked to see that he has disappeared, leaving behind only a letter in the mouth of the King's dog Pluto, explaining his absence. Donald rushes to tell Goofy about the King's absence, but his secret is quickly discovered by Queen Minnie and Daisy when they overhear him telling Goofy what happened. King Mickey's letter explains that darkness is threatening the worlds, which appear as stars in the night sky, and have been blinking out one by one. Therefore, he left in order to study and counter the threat, and provides Donald and Goofy with a mission to seek out the "Key". To start, they must head to a world called Traverse Town to find a man named Leon. Donald and Goofy, loyal to their king and concerned about his welfare as well as the worlds', agree to take on the mission. Queen Minnie also introduces them to another traveling companion, Jiminy Cricket, who will chronicle their travels in his journal. With the three of them as well as Pluto, they take the Gummi Ship and begin their journey. Donald and Goofy soon arrive in Traverse Town, having gained new, more casual, clothes. They set out in search of Leon and the key, but end up meeting Aerith, a friend of Leon's. She explains to them the situation with the Heartless, the Keyblade, and the Ansem Reports, a document written by "Ansem" that details his findings on the Heartless. However, things take a turn for the worst when Heartless attack the hotel that Donald and the others are in (with Leon, Yuffie and Sora, the Keyblade wielder they have been searching for, in the next room). Donald and Goofy are about to go talk to Leon, but Yuffie dashes out of the room and crushes Donald with the door in her haste. Donald and Goofy arrive in the Third District, where they attempt to fight some Heartless, but are unable to defeat them, and a massive explosion sends them flying through the air and right on top of Sora, where they immediately recognize the Keyblade in his hand. However, before they have a chance to formally introduce themselves, they are attacked by a giant Heartless known as the Guard Armor, starting a fight that they manage to win. Donald and Goofy forming a bond with Sora. After the battle, the three introduce themselves. Donald and Goofy explain that they have been searching for Sora, and that if he travels with them, they can go search for the King as well as Sora's friends Riku and Kairi; however, Donald secretly tells Goofy that he doesn't know if they will find Sora's friends, but they need him either way if they expect to find the King. Donald proceeds to tell a depressed Sora to cheer up if he wants to come with them. Sora attempts to look happy, but only ends up making a fool of himself, much to Donald and Goofy's amusement. Nonetheless, Sora agrees to accompany them, and the three set off. Sora, Donald, and Goofy set off to many worlds, defeating Heartless, the Disney villains, and sealing Keyholes that lead towards the hearts of worlds, as well as making many new friends. Of course, the journey is not without its problems, such as at Deep Jungle; Donald and Sora end up angry at each other after they have an argument involving their search for the King and Sora's friends (like when they saw Riku and Donald said he can't come, causing Sora to realize the duck lied to him), but their friendship ultimately prevails and the two make amends. The three eventually make their way to Hollow Bastion, the world that Leon and his friends hail from, and which Maleficent has turned into her base. To everyone's surprise, they encounter Riku, whom just wounded an other-world resident named Beast. Riku manages to take the Keyblade from Sora, revealing that Riku is in fact the true Keyblade master. Having been explicitly ordered by Mickey to follow the Key, Donald and Goofy decide to leave Sora and follow Riku, much to their regret. With the aid of Beast, Sora catches up with Riku. With the Beast lured away by a Heartless feigning to be his beloved Belle, Riku attempts to eliminate Sora once and for all with a dark blast. However, Goofy comes to the rescue and blocks the attack, finding himself unable to betray Sora after all that they had been through together, and Donald rejoins them as well, saying, "All for one, one for all." Amazingly, the strength of their friendship also strengthens Sora's heart, and because his heart became stronger, he is able to regain the Keyblade, meaning that Donald and Goofy are no longer going against orders. The trio then make their way through Hollow Bastion, confronting Maleficent as well as Riku, who is now possessed by Ansem and wields a Keyblade forged from the hearts of six of the seven Princesses of Heart. Upon their second encounter with the possessed Riku, Donald leaps to attack him, but is easily swatted away, and he and Goofy are separated from Sora by a barrier set up by Riku to prevent them from interfering. They also come across Kairi's body, devoid of her heart. When Sora discovers that Kairi's heart rests within his own, he chooses to release it by stabbing himself with the dark Keyblade left behind by Riku, despite Donald and Goofy frantically trying to convince him otherwise. While Kairi's heart is restored, Sora's is lost, and he becomes a Heartless. Donald is clearly distraught by this, running over to Sora as he fades away and desperately screaming for him to come back, to no avail. In the Kingdom Hearts manga, Sora tosses the Kingdom Key to Donald before releasing his and Kairi's hearts, but the Keyblade disappears as soon as he does. Ansem makes his reappearance (and now in nearly total control of Riku's body) soon afterwards, planning to kill the revived Kairi now that her usefulness to him has ended. Donald and Goofy bravely make a stand against Ansem, but both know that they might be no match for him alone. Before Ansem can make his strike, however, Riku is able to take control, holding back Ansem temporarily. Donald and Goofy then attempt to escape with Kairi. Donald and Goofy shield Kairi from the surrounding Heartless. At the foyer of the castle, Heartless block their path. However, another Heartless, seemingly without hostile intentions, arrives. Donald shouts at it to get lost and bonks it over the head with his staff, but Kairi realizes it is Sora, and is able to revive him, much to Donald and Goofy's relief. The four then make their escape. Back in Traverse Town, they inform Leon's gang of the threat of the darkness, which is allowing Heartless native to other worlds to pop up in others. The trio are sent by Cid to retrieve a Navigation Gummi from the Secret Waterway, to help them get past the hordes of Heartless spreading out from Hollow Bastion. The trio then make their way back to Hollow Bastion, fighting their way through Heartless and sealing up the Keyhole opened up by the seven princesses. They then journey to the End of the World, the home of the Heartless. There, they confront Ansem at the remains of Destiny Islands, and then at the endless abyss, where the Door to Darkness that leads to Kingdom Hearts itself resides. After Ansem's defeat, Sora, Donald, and Goofy attempt to seal the door, but their efforts are futile. Donald, Sora, and Goofy realize their quest is far from over. But then, the King makes his appearance, wielding the Keyblade of the Realm of Darkness. With the two Keyblades and the assistance of Riku, the Door to Darkness is sealed, and the worlds are restored. However, the King and Riku are sealed in the Realm of Darkness, though the King leaves Donald and his companions with the knowledge that there will always be a door to the light. After the worlds are restored, Sora, Donald and Goofy walk along a long dirt road through grassy plains, searching for the King and Riku. Donald and Goofy are inexplicably wearing their original clothes. There, they catch sight of Pluto, who again has a letter from the King. Opportunity arising, the three chase after Pluto, heading off towards another journey. Sora, having encountered a mysterious figure, travels with Donald and Goofy to Castle Oblivion. Inside, they discuss going further into the castle, realizing that all four of them, including Jiminy, feel that Riku and the King are in the castle. Before they can progress, they meet the mysterious man once more. Donald, assuming the man to be a Heartless, attacks, but finds out that none of his spells will function. The man reveals that Sora and his friends forgot every single ability they knew as soon as they entered the castle. In addition, the figure remarks that in this castle, they will find someone they know. Granting Sora a card, the figure leaves, and the others are compelled to follow. Unfortunately, as they progress through the castle, they find that their memories are slowly fading. One example would be how Donald forgets the name of the castle they had visited before: Hollow Bastion. Additionally, they experience memories they had forgotten long ago, such as Naminé, a supposed former resident of Destiny Islands, and a friend of Sora. In truth, however, their memories are being manipulated by Naminé herself. Also, they begin to encounter members of Organization XIII, including Axel, Larxene, and Vexen. All leave cryptic remarks about the nature of Castle Oblivion, including memories and Roxas, the other half of Sora's heart. Later on, they meet Riku, who apparently is also striving to reach Naminé, but has once again turned on Sora. Donald and Goofy reason that Riku just forgot that Sora and he are friends, but Sora still slowly succumbs to anger at all the things that have been happening to him. The three, after Vexen had been eliminated by Axel, become separated once Sora's anger at the Organization's manipulations overcomes him. When Sora is caught off by Riku, who in turn is knocked unconscious by Naminé shattering Riku's memories apart, Donald and Goofy arrive to save Sora from Larxene and the trio defeat her. It is then that they learn of Naminé's true nature, as well as the fact that the Riku before them is only a replica of the real person. Naminé tells them that she can restore their memories, but only after they defeat Marluxia, the lord of Castle Oblivion, who had been manipulating them the entire time they were in the castle. The three then travel to the 13th floor of Castle Oblivion. By this point, however, Donald and Goofy have forgotten about King Mickey, only recalling that they are looking for someone important. Naminé shows Sora, Donald, and Goofy the memory pods. As they make their way to Marluxia, the three also make an important promise: that no matter how far apart they are from each other, or if they have forgotten each other, they will always be friends. Using that promise as strength, they go on. The trio then confronts Axel and Marluxia, with Marluxia using Naminé as a human shield. Marluxia escapes, but the three manage to defeat Axel, and soon after chase down and defeat Marluxia. Naminé then leads them to memory pods, where they can sleep while Naminé fixes their memories. Donald and Goofy say goodnight, and leave, while Sora and Naminé say goodbye. Donald appears within Roxas's dreams of Sora. Donald, like Sora and Goofy, has been asleep in special chambers to regain his lost memories. Donald is unknowingly visited by Roxas, Sora's Nobody. Donald and Goofy are the first to wake up out of the trio. Sora awakes soon after and is reunited with Donald and Goofy. The three encounter Hayner, Pence and Olette when they enter Twilight Town, and then a group of Nobodies at the train station, but are saved by the timely arrival of King Mickey, who sends them off to the tower of Yen Sid, who Donald greatly respects. The trio also encounter Pete at the tower. Donald and Goofy journey with Sora across the stars again in search of the missing King and Riku, who is actually following them and leaving them clues to his location and Roxas' connection to Sora. Donald helps out several times during the journey, including finally killing Oogie Boogie by stepping on the bug that is his core conscious. However, Donald seems to develop an attraction to treasure (probably an inherited trait from his Uncle Scrooge), as seen in Agrabah, where he fights Abu for a red diamond, and in Port Royal, where Sora and Goofy share a joke about Donald being lost to the curse of the Aztec gold, much to Donald's irritation. It is also hinted that Donald has a terrible singing voice; in Atlantica, when Ariel keeps getting distracted while rehearsing for Sebastian's musical, Donald offers to sing her part in the musical, and Sora immediately rejects the idea. Donald is overjoyed when he is reunited with King Mickey, practically leaping upon his king to hug him, eventually having to be pushed off by Mickey himself. During the Battle of Hollow Bastion, Mickey orders the trio to go search for Riku and Kairi and leave the Heartless to them. Sora is extremely reluctant to leave, so Donald and Goofy go against Mickey's orders and assist Sora in helping Leon and the others, apologizing to the king as they do so. When Goofy seemingly dies during the Battle of Hollow Bastion, Donald completely loses control of his rage and rushes off to destroy Heartless. Goofy later appears unharmed and an enraged Donald hits him in the kneecap with his staff, telling Goofy never to "scare me like that again!". Sora, Donald, and Goofy reunited at Destiny Islands. Donald travels with Sora into the digital Twilight Town and sees the death of Axel. They journey through The World That Never Was and are reunited with Riku and Kairi. Donald helps defeat Xemnas and leaves with the other Disney Castle residents through a portal opened by Naminé. After he stepped through with Pluto, Mickey, Goofy, and Kairi, Xemnas closes the portal, preventing Sora and Riku from returning, forcing the two of them to battle him one last time. He is reunited with Sora and Riku when they return to Destiny Islands. The three of them share a joyful moment before Sora turns his attention to Kairi. After their long journey, Donald returns to Disney Castle with Goofy, Mickey, Pluto, his nephews, and Scrooge McDuck and is happily reunited with Daisy. Donald and Goofy, stationed once more in Disney Castle, are present in aiding King Mickey solve a mystery regarding a mysterious message written in Jiminy's Journal. While they find clues and mysterious additions to the journal, Heartless suddenly appear in their castle. King Mickey manages to fend them off, but when they try to leave the library, where the data experiment is being held, they find themselves trapped inside. Later, Donald and Goofy enter the digital version of Hollow Bastion to assist Data-Sora in fighting against Pete and the Heartless. Donald, Mickey, and Goofy watch Yen Sid prepare Sora and Riku for their Mark of Mastery exam. Donald is present in the Mysterious Tower alongside Mickey and Goofy when Yen Sid prepares to put Sora and Riku through the Mark of Mastery exam. While in the sleeping Country of the Musketeers, Sora learns about Donald's past as a musketeer. Later, Donald is forced to accompany Mickey and Goofy to Disney Castle when they receive word that Maleficent has returned and taken Minnie hostage. The three confront Maleficent and Pete in the castle library, where Maleficent tells them about her first encounter with Master Xehanort and demands access to the Data Worlds. Mickey refuses, and they are saved from battling Maleficent by Lea, Axel's restored original persona, who joins forces with them and accompanies them back to the tower, where he makes a shocking request from Yen Sid. Donald and Goofy later use Mickey's old Star Shard to return to The World That Never Was and help Riku, Mickey and Lea in saving Sora from Master Xehanort by striking Ansem's Guardian from behind and knocking it out. They bring Sora's comatose body back to the tower, and Donald is visibly ecstatic when Riku succeeds in awakening Sora, and later shocked when Lea brandishes his own Keyblade. Donald later bids farewell to Sora when the latter leaves to train alone, and greets Riku when he returns with Kairi. Donald and Goofy greet Sora when he returns to the Mysterious Tower after a secret mission just as Riku and Mickey leave to rescue Aqua from the Realm of Darkness. As Yen Sid informs Sora of his lost power, Donald playfully chastises him for failing the Mark of Mastery exam, and accompanies him, along with Goofy, to visit Hercules at the Olympus Coliseum for training. Donald and Goofy join Sora's side again to help him discover the power of waking and to help regain his lost strength. The trio goes to Olympus to find a way to restore Sora's strength, but their visit proves fruitless and they are now set on following Roxas's heart and setting him free. After adventuring through various worlds, the trio gets a call from Chip and Dale, informing them that Riku and King Mickey are in danger in the Dark World and Sora opens up a gate that takes them to the Destiny Islands. The trio find Eraqus's Keyblade, which Sora uses to unlock a path to the Dark World. Donald and Goofy stay behind while Sora heads to the Dark World and he is present when they reunite with Aqua. The trio goes with Aqua to the newly restored Land of Departure to wake Ventus up and are confronted by Vanitas. After Sora awakens Ventus with the power of waking and Vanitas departs, the guardians return to Yen Sid's tower to rest in preparation for the coming battle with Xehanort. All the guardians arrive at the Keyblade Graveyard where they are greeted by Master Xehanort and the other seekers of darkness and are ambushed by a massive swarm of Heartless, Nobodies and Unversed. The trio battles the horde and comes out victorious and they quickly catch up to the other guardians of light coming face to face with Terra-Xehanort. The guardians are quickly overwhelmed, but gets staggered by Goofy and Donald uses a powerful Zettaflare spell to finish him off. As a result of using such a powerful spell, Donald collapses to the ground exhausted after using a lot of energy from that attack. All the guardians of light get swept away from a massive Demon Tide and Donald loses his heart from it, but Sora is able to save his heart as well as the other guardians of light that fell in battle. The guardians confront Terra-Xehanort but Terra's lingering will fights him and defends the guardians. Sora, Donald, and Goofy face off against a Demon Tide, which Sora manages to dispatch thanks to the help from the light of the past. Afterwards, Xigbar and Dark Riku come in to taunt the guardians before summoning another massive swarm of enemies. The guardians are overwhelmed, but then they're saved by Yen Sid who creates a path for all the guardians to advance though Donald and Goofy stay behind to defend Yen Sid. Donald and Goofy and the other guardians catch up to Sora and find that Xehanort has summoned Kingdom Hearts and Darkness is quickly spreading. Mickey and Riku get the idea to trap Xehanort as he's a portal and finish him off. Sora takes up the job and Donald and Goofy go with him and with the help of the guardians, the trio crosses over into the portal and arrive at Scala ad Caelum for the final battle with Xehanort. The trio emerge victorious over the battle and are quickly rejoined by the other guardians. Xehanort gives Sora the χ-blade before passing on and Sora uses it to close Kingdom Hearts. The guardians return to the Keyblade Graveyard and Sora decides to go look for Kairi despite knowing the risks if he uses the Power of Waking too many times. In the aftermath, Donald, Goofy, King Mickey, Jiminy, and Yen Sid return to Disney Castle where they are reunited with Queen Minnie, Daisy, Chip and Dale and Pluto and watch a fireworks show over the Castle. Donald, Goofy, and King Mickey then head to the Destiny Islands to celebrate their victory with the other guardians and they all watch Sora and Kairi share one last moment before Sora completely vanishes. Donald is an anthropomorphic duck with white plumage, a yellow-orange bill, legs of the same color, light blue eyes, and a short tuft of feathers on his head, visible under his hat. His outfit is a modified version of his original blue sailor's suit (in fact, he wears his original clothes in the opening of Kingdom Hearts Chain of Memories). His blue hat, which resembles a beret, has a belt in place of a normal brim, and sports a zipper that spans the length of the hat. His high-collared jacket is navy blue with sky blue lining and cuffs. There are three pouches, all of which are blue with yellow lining, along the middle of the jacket; the center pouch is secured by a flap, while the other two use silver zippers. The middle pouch is framed by two other silver zippers that span the entire length of the jacket, from the top of the collar to the bottom. He has a short, blue cape with yellow lining that he wears draped over his shoulders, kept in place by a silver strap. Donald also wears a thick, gold bangle on each of his wrists, and, like his cartoon version, he does not wear pants. 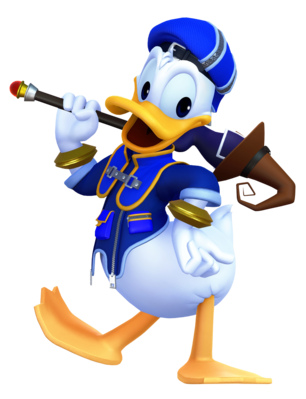 Donald also wears a shorter, light blue coat over his jacket, this one with more bell-like sleeves, gold lining and cuffs, a turtleneck-esque collar, and the two silver, vertical zippers present in his jacket in Kingdom Hearts and Kingdom Hearts II. Donald's webbed feet are also slightly different in this appearance, as the toes are less distinguished. Donald is the most aggressive of the group. Though he has mastered spells, Donald is very reckless and is the comic relief in many games. Initially, he and Sora often argued, but in the end grow into a deep friendship. Donald is also very protective over Goofy and King Mickey as he is the most worried in Castle Oblivion when he fears he will forget about Mickey and when he thinks Goofy is dead, he flies into a rage and destroys many Heartless. Despite Donald's short-tempered and impatient nature, he is actually goodhearted, as he would sacrifice anything for the sake of friendship. This is proven twice in the games: when he initially leaves Sora to follow Riku after he obtained the Keyblade, he instead eventually chooses to return to his side; also when the King orders him and Goofy to take Sora from Hollow Bastion to look for Kairi and Riku, he chooses to against his orders to help Leon and the others protect Hollow Bastion. He also seems to be afraid of Daisy as shown at Disney Castle when she yells at him for missing their date. He also has somewhat of a greedy side, as commented when Sora and Goofy expressed worries that Donald would lose himself to the curse of the Aztec gold in Port Royal, or when Abu stole a sparkling ruby and Donald became infatuated with it. 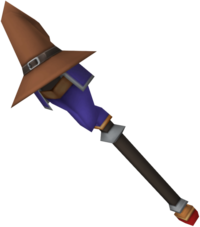 Mage's Staff, Donald's default staff. In contrast to Goofy who is a physical party member, Donald focuses on his magic in battle. He equips rods, and is capable of conjuring all the magic that Sora has learned (excluding Summon magic). Unfortunately, Donald is far less capable of enduring attacks compared to his allies and is often knocked out a lot. Overall, Donald is a good support in terms of offense, as well as healing Sora in tight situations. He is also shown to be a fighter on a fairly effective level due to having a sufficient strength stat, able to fight his enemies with his staff if and when his magic runs out. His Limit unleashes a variety of powerful magical attacks in the form of rockets and fireworks. In Kingdom Hearts Re:coded, he appears as an ally in Hollow Bastion, where he casts Fire and Thunder spells using Sora's converted commands. In Kingdom Hearts Birth by Sleep, Donald becomes a Dimension Link for Aqua and Ventus, able to project his magic to assist them in times of need. His Fantasia attack has been seen to be implemented as one of the D-Link's attacks. Donald is the main spellcaster in the party, so he has high MP to make up for his low HP. Donald attacks using magic, and as such his abilities focus on increasing his magic power. Donald's support abilities include MP-related boosts, such as MP Haste and MP Rage, HP-related boosts, such as Second Chance and Berserk, in addition to a number of other miscellaneous perks, including Treasure Magnet, Second Wind, Lucky Strike and Cheer. Along with Goofy, Donald has access to shared abilities, meaning that his mobility is on par with Sora's. All of Donald's combat abilities are magic spells that Sora obtains, meaning that his repertoire of magic grows in lock-step with Sora's. Donald's spells are divided into three main categories, and the frequency at which he draws from each category can be set by the player. However, the exact spell he uses in combat is ultimately due to his own situational AI. Offensive Magic contains the destructive spells of Fire, Blizzard, and Thunder. Defensive Magic includes the protective and restorative spells of Aero and Cure, Lastly, Advanced Magic encompasses negative status-effect inflicting spells, such as Gravity and Stop. In Sora's story, Donald appears as a friend card that causes Donald to appear on the battlefield and cast two magic spells consecutively. Stocking two or three cards create the Magic Lv.2 or Magic Lv.3 sleights, which allows Donald to cast higher tiered spells. The Donald card is also required to perform the Trinity Limit sleight, alongside a Keyblade and a Goofy card, executing a powerful attack that deals high amounts of damage. Additionally, the Donald card can be combined with magic cards to create the Blazing Donald sleight in Kingdom Hearts Chain of Memories. However, in Kingdom Hearts Re:Chain of Memories, the Blazing Donald sleight is removed as two new sleights are added instead: Stardust Blitz, involving Donald and a Fire card, and Wild Crush, which acts as a more powerful version of Trinity Limit. Donald is unlocked as a playable character in Mission Mode, after being promoted to "Expert" rank on Day 225. He is one of the most inept characters in the game as he possesses the lowest stats, however he boasts the highest magic power, exceeding Zexion's. Donald's Limit Break is Fantasia, which creates many colorful explosions that damage enemies. Donald has two armor slots, three accessory slots, and three item slots. 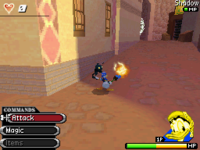 Unlike in the first game, Donald's magic is limited to four basic spells, which are his only action abilities: Donald Fire, Donald Blizzard, Donald Thunder and Donald Cure. When performing Trinity Limit with Sora and Goofy, Donald pulls in enemies and blasts them with fireworks. Donald has two limit abilities. Fantasia causes Donald to bombard enemies with fireworks and pure energy. The second limit, Flare Force, allows Donald to release a barrage of rockets. Additionally, Donald has access to a number of support abilities, mostly involved with improving his magical potency. These are Draw, Jackpot, Lucky Lucky, Fire Boost, Blizzard Boost, Thunder Boost, MP Rage, MP Hastera, Auto Limit, Hyper Healing, and Auto Healing. In Hollow Bastion I, Donald joins Data-Sora as a party member when he lacks his Keyblade. Along with Goofy, Donald follows the current order of the Ask for Help. Each of the magic commands in the Command Matrix are substituted with one of two of Donald's commands, Donald Firaga and Donald Thundaga. Donald's debut in The Wise Little Hen. Donald originally debuted in the 1934 Disney short The Wise Little Hen, in which his self-centered nature is seen when he, along with his friend Peter Pig, fake stomach aches so they avoid physical work to help a hen with planting and harvesting her corn. Since then, Donald became popular in cartoons, alongside Mickey and Goofy. Donald is one of three characters to break the series's fourth wall. In Kingdom Hearts, during the scene in which Donald and Goofy speak with Aerith, Donald appears to move the "camera" down so that he is properly visible. The others are Genie and Mushu.